If you want to avoid a mobile photo-radar ticket, don’t go anywhere near Grant Avenue and Thurso Street. You may also want to avoid driving during the afternoon rush hour anywhere in Winnipeg, particularly on Wednesdays. 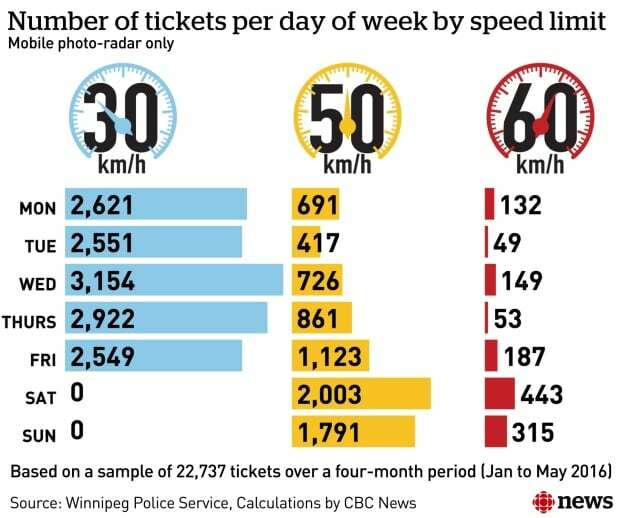 A CBC News analysis of 22,737 mobile photo-radar tickets handed out over a four-month period in 2016 found the City of Winnipeg dinged more motorists for speeding on Grant at Thurso than at any other location in the city, more motorists on Wednesdays than on any other day of the week, and more drivers between 4 and 5 p.m. than during any other hour. Geographically, Grant at Thurso — a stretch that runs alongside Grant Park Shopping Centre — is the easiest place to get a ticket. A total of 2,916 motorists were nailed by mobile photo-radar equipment for driving faster than 50 kilometres an hour at this River Heights intersection from Jan. 1 to May 1, 2016. “That one fools a lot of people, my family included. I believe my own wife got a ticket there,” Winnipeg police Chief Danny Smyth said Thursday. River Heights-Fort Garry Coun. John Orlikow, whose ward includes the offending intersection, said the city needs to do something to mitigate the number of speeding tickets along this section of Grant Avenue. “Maybe it’s increasing the speed limit. Maybe it’s more signage. Maybe it’s more engineering to the street,” Orlikow surmised Thursday. Last June, he presented a motion that would require the city to flag the top two locations where violations occur each year. He said the goal is for Public Works and the police to propose measures to reduce speeding and increase safety, rather than leaving the locations unaddressed, allowing them to continue generating tickets. In 2003, the public works department recommended increasing the speed along this stretch from 50 to 60 kilometres an hour. A study found the natural speed for most motorists was between 61 to 68 along the route and found the collision rate to be in line with other regional streets. “Furthermore, it is expected that making these changes to the speed limit at these locations will … provide motorists travelling along these routes with a more consistent driving environment in terms of uniformity in speed limits,” said the report’s author. However, a motion rejecting the recommendation by then-councillor for River Heights-Fort Garry Garth Steek was carried, effectively freezing the speed at 50. 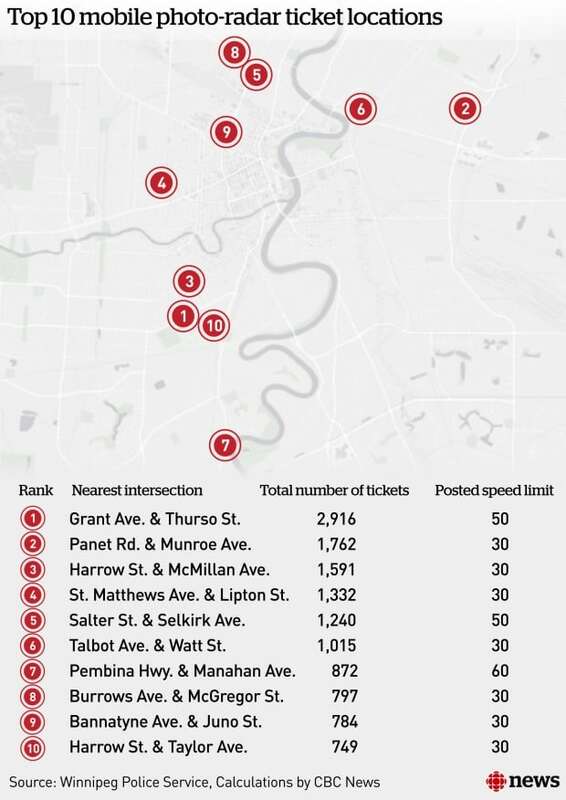 But the 50-an-hour speed zone at Grant and Thurso actually is an anomaly, when it comes to places where mobile photo radar nabs the most motorists. The mobile photo radar data, obtained by CBC News after an 18-month freedom-of-information dispute, reveals most motorists are caught in 30 km/h zones. Seven of the top 10 stretches of road where drivers were caught during the sample period had 30 km/h speed limits, while a total of 61 per cent of the tickets were generated in 30 km/h zones. Police Chief Smyth said he’s not surprised. Provincial legislation gives police no choice but to direct their mobile photo radar contractors to set up their equipment around schools, playgrounds or construction zones, he said. Smyth said the police would like to place mobile photo radar on regional streets where conventional photo enforcement operations would endanger officers. “I certainly would like to have greater flexibility to be able to deploy in some of these high-speed corridors,” Smyth said.